In this video I’m showing you a method I developed to make kimchi simply and easily. It’s faster and easier because I skip the porridge-making step, I use common cabbage instead of napa cabbage, and I don’t use oysters or fermented squid. Total time to make this kimchi is 30 minutes. If you have fast hands, it might be 20-25 minutes. 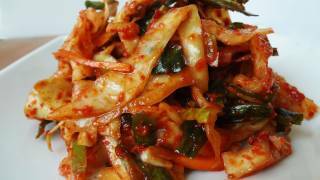 Most people know that traditional, authentic kimchi is made with napa cabbage (in Korean: “baechu”). While I travel, I sometimes see napa cabbage sold at local markets, but it’s not available in many countries. So when I want kimchi when I travel I make it with common cabbage (in Korean: “yangbaechu”). I know others have also been experimenting with this. You could use this recipe when you need to make kimchi rapidly, or if there’s no napa cabbage where you live. I stayed at the beach in Puerto Escondido, Mexico for 4 days. I made this kimchi on the second day and enjoyed it for the rest of the time I was there. The leftover kimchi was given to my new friend Bev from Arkansas. I’ll tell you about her in my next blog. Cabbage, salt, hot pepper flakes, fish sauce, sugar, garlic, green onions, and carrot. Cut 2 pounds of cabbage into thin strips about 2-3 inches in length and ¼ inch wide. Place into a large bowl. Add 1 cup cold water and ¼ cup kosher salt. Mix it well with your hands to properly salt the cabbage. Wash and rinse the salted cabbage in cold water a couple of times. Drain the water. Mix the kimchi paste into the cabbage thoroughly. Put the kimchi into a container, jar, or plastic bag. Press the top of the kimchi down with your hands to protect your kimchi from being exposed to too much air. You can eat it right away, just like salad. Or keep it at room temperature and it will ferment in a few days. 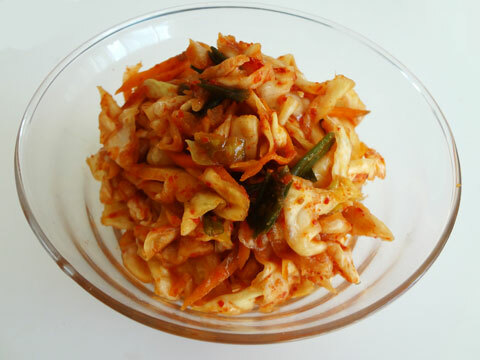 Fermented kimchi can be used for kimchi stir-fried rice or kimchi stew, and it will be delicious. Posted on Saturday, March 5th, 2011 at 10:21 am. Last updated on October 5, 2014. Posted December 29th, 2018 at 9:56 pm | Log in to reply. Hello maangchi imo and everyone! Yesterday I tried making kimchi. I salted the cut cabbage for 2 hours, with 3 tablespoon table salt dissolved in 2 cups water. After that, I used a kimchi base I found at a store. I left it on my kitchen counter overnight in a covered container. This morning, when I tasted the kimchi, it tasted bitter. Any ideas why and how I can fix this? Thanks. Posted December 23rd, 2018 at 11:56 pm | Log in to reply. Does it still make the kimchi juice? Posted November 2nd, 2018 at 2:00 pm | Log in to reply. Hi Maangchi! This looks so good. I love kimchi but have never made it before. I think I might begin with this recipe because it is smaller and less intimidating. But I think I will use napa cabbage instead of the round cabbage and maybe also include radish. The kimchi I normally buy also has apple in it, so I am wondering does this mean I should use fresh apples or apple juice? By the way, I have also been to Puerto Escondido! I really enjoyed the beach there! Thanks for sharing your recipe! I always love your recipes and videos. Posted September 18th, 2018 at 5:54 pm | Log in to reply. Maangchi, thank you so much for this simplified and brilliant recipe – things are quite tight financially for me right now, and I don’t think I could make traditional kimchi with napa cabbage and the other trimmings, but I still need my kimchi fix! This is a superbly affordable recipe, and I made two kilograms of it tonight. It already tastes just like freshly made kimchi is supposed to — I can’t wait until it’s had the chance to ferment! Posted September 23rd, 2018 at 9:50 am | Log in to reply. I’m glad to hear that you like this recipe! Yes, many of my readers let me know they make kimchi stew with this cabbage kimchi and it turns out delicious! Posted September 4th, 2018 at 4:11 pm | Log in to reply. Aloha Maangchi! I made this on Sunday with some leftover cabbage. I didn’t have green onions but added sliced regular onions with the garlic and carrots. I couldn’t believe how easy and quick it was to make…and after fermenting for two nights…it tastes great! I love regular kimchi but since having my second child, I don’t have the time it takes to make it. This recipe will be my new go to recipe for now! Ingredients are so much easier to find, and cheaper too! If you ever vacation on Maui please do a meetup! I know lots of people who would be interested! Mahalo and Aloha from Maui! Posted September 4th, 2018 at 4:13 pm | Log in to reply. I forgot to include my picture of the emergency kimchi (right)… I also made cucumber kimchi on Sunday too (left)! Posted September 5th, 2018 at 9:36 am | Log in to reply. Posted January 24th, 2018 at 3:15 pm | Log in to reply. Amazing, I just made this! I love how quickly this came together. The flavors the excellent, I did make sure that the kimchi was pressed downs firmly with a bowl to weight it while covered in the container. Thank you , this is a keeper for me. The Korean ground chili peppers are key to this. Posted January 6th, 2018 at 12:12 am | Log in to reply. I made this tonight and it came out amazing! Exceeded my expectations. I’ve always been afraid to make kimchi because my mom’s is the best and making kimchi always seemed intimidating to me. 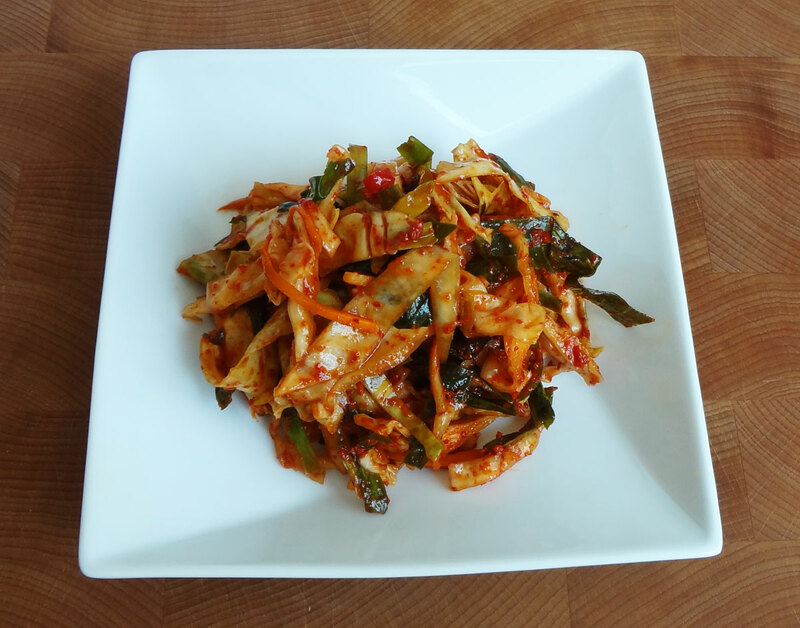 Now I have a go-to recipe for a quick and easy way to satisfy my kimchi fix! Thank you!!! Posted October 9th, 2017 at 5:02 am | Log in to reply. I am waiting for a long time to make kimchi, but I’m afraid that I will mess it since I couldn’t find some ingredients. 1. Here there’s no where to find Hot Pepper Flakes and can I use Red Chilli Flakes/Powder instead? 2. We have just normal rice flour and can I use them to make the porridge instead glutinous/sweet rice flour? Or can I just make kimchi without making a porridge and how long will it last? Posted June 27th, 2018 at 2:04 pm | Log in to reply. Hello! I know this comment is very late, but in case you want to know, I live in Sri Lanka too and I’ve made kimchi with chilli powder and it turned out just fine! Gochugaru is probably better, though. Also, for glutinous (sweet) rice flour, you can go to a Chinese store to buy it or just use regular flour (as said in Maangchi’s traditional kimchi video). I’m making my second batch and I’m going to try using a combination of chilli powder and crushed red chilli, I’ll tell you how it goes! Posted June 27th, 2018 at 2:25 pm | Log in to reply. I just checked and regular rice flour can also be used! Posted June 28th, 2018 at 7:36 pm | Log in to reply. I’ve made the kimchi and it turned out great! I used very little chilli flakes though, and more chilli powder. Posted August 28th, 2017 at 7:24 pm | Log in to reply. I made today the kimchi its soooo nice and I did it with red paprika and hot chili powder cause I dont have the chili but actually I got 95% of the orginal kimchi its fermenting. But cause its so hot in ksa can I ferment it in 1 day only? Posted July 12th, 2017 at 5:42 pm | Log in to reply. I found a different type of cabbage which called savoy cabbage a few days ago. It looked thinner than normal cabbage. so I picked it up and I made a kimchi with it as soon as I back home. 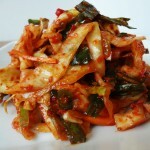 Finally, today I made kimchbokkeumbab with this kimchi, actually it wasn’t fermented fully but I couldn’t wait. In conclusion, it wasn’t bad but not perfect for proper traditional kimchi because its leaves are a bit thicker than napa cabbage. I will try to make kimchi with savoy cabbage soon again. Next time I’ll use more salt when it’s soaked or sit aside longer. anyway thank you maangchi. you always encourage me to cook, especially make kimchi!! Posted April 10th, 2017 at 5:01 am | Log in to reply. I love your recipies! Yesterday I made emergency kimchi but it is so salty. i don’t have radish to add. If I add more cabagge it will be okay? This recipe was originally posted on March 5, 2011 at 10:21 am by Maangchi. It was last updated on October 5, 2014. The video was watched 1,435,264 times on YouTube & has 15,844 likes!